As a topic of increasing relevance in the 21st century, this high-profile, non-profit charity gala brings together families, NGOs, businesses, individuals, trusts, Ambassadors and High Commissioners to discuss and raise awareness of this prominent issue. Local Family Television will be raising funds in support of Deaf Parenting UK at their special, Celebrity Fundraising Gala 2012. 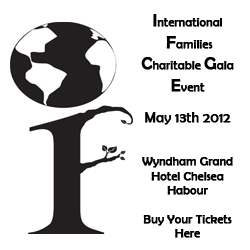 The event, which will take place on 13th of May 2012 at the magnificent, 5-star Wyndham Grand Hotel Chelsea, will celebrate the UN’s International Day of Families while raising money for a number of important UK charities. The theme for this year is Hollywood and Bollywood and Local Family TV will have a number of celebrity designers showcasing their work in an exclusive fashion show as well as special guest speakers and a mysterious luxury prize draw. Sabina Iqbal from Deaf Parenting UK will be giving a speech to remind our guests of the important cause, we support and of our partnership with Local Family TV to continue delivering new services and support programmes for Deaf Parents across the UK. Last year, representatives from 15 Head of States came in support of the private event, while fashion leading lady Sienna Miller sponsored the gala with her Twenty8Twelve collection. Sofia-Chezene Theophilou, founder of Local Family TV said: “On 16th May 2011 history was made when it showed that countries around the world supported the important role of families by attending the event and I cannot wait to see each country having a UN Ambassador one day and incorporate this in the Family Rights Charter. Funds raised will go towards new development plans and stronger support systems for Deaf Parenting UK. GREAT ORMOND STREET – Great Ormond Street Hospital provides inspirational, world-class care to hundreds of children every day. To help them continue their work, we need to raise over £50 million each year. You can help us help them by attending our event. MAKE-A-WISH FOUNDATION UK – A mother said “ The day was just of out this world it was unbelievable; at one point there were about 20 people making her happy! We are very grateful to Make-A-Wish for how amazing it all was – Victoria was completely spoilt!” Please help us to continue to make all these children’s dreams come true by coming to the event and helping us raise £6.8 million in 2012. AID FOR JAPAN – Over 350 children were left orphaned after Japan was hit by itstragic tsunami 2011; Akemi Solloway now needs to raise £5000 for charity registration and more so that these orphans are given a chance to lead happy, healthy lives. Please help orphans by coming and supporting the event. DANCEAID – We have all seen TV show Got to Dance – taking this idea to a more global level, Danceaid is a new and exciting charity that harnesses the energy of dance to transform the lives of vulnerable children both in the UK and abroad. Every penny will go towards the development of fundamental projects that support and protect children growing up in the developing world. Help us to help them by coming to the event. DEAF PARENTING UK – Enabling confidence, empowering and supporting Deaf Parents in the UK. Help the organisation deliver new services and programmes to support the development of Deaf parents by meeting the parents and finding out more about the individuals behind the work. This year’s national theme is Hollywood and Bollywood, so this is a strictly Black Tie, Ballgown, Cocktail dress or Bollywood-style attire event. Fashion Show only: £30.00 including access to the show and a glass of wine or juice (60% of ticket price goes to the charities). Please note seats are very limited for the show. Prize draws: An exclusive, luxurious prize can be won by a lucky standard or VIP ticket holder. There will also be prize draws for other items throughout the day and evening. To purchase your ticket online – click here and 20% of the tickets price will go toward the named charities. – Exhibitions opens to include cultures from around the world. Presenters)followed by the LFTV Family Rights Charter feature. – Winner of Family-Friendly Logo: a competition by children from St Joseph School in Chelsea. 7.45pm Evening prize draw: Anexclusive and deluxe mystery prize open to Standard and VIP ticket holders only.